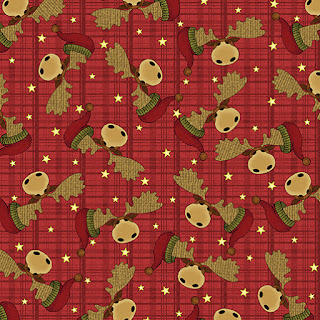 Today we're sharing Cheryl Haynes' A Moose for Christmas line. 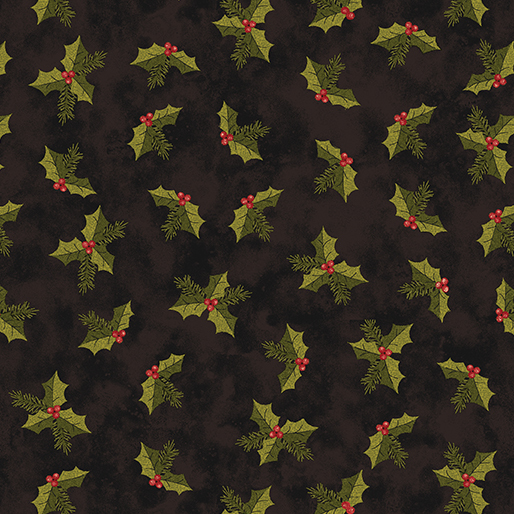 If you loved her Moose on the Loose collection, you'll be happy to see this holiday version! What inspired the A Moose for Christmas? When I did the original moose quilt pattern (that inspired Moose on the Loose), I was working on a cross stitch project at the same time. It was an ornament called ChrisMoose—a moose head with ornaments hanging on the antlers. 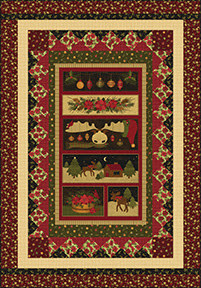 The moose panel idea came from the cross stitch pattern. Tell us more about the panel. I added in the poinsettia sections because I like poinsettias, and they have a holiday feel. The ornaments were a natural fit because they’re also hanging on the moose. What are a few of your favorite prints from the collection? I just love the moose heads with the stocking caps. It’s cute, and it makes a great border. 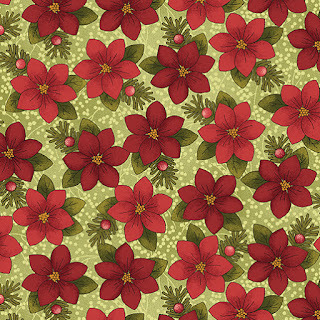 I also really like the other holiday-themed fabrics—the ornaments, the poinsettia, and the holly. What’s fun about these prints (like the moose head print) is that they correspond well with different parts of the panel. 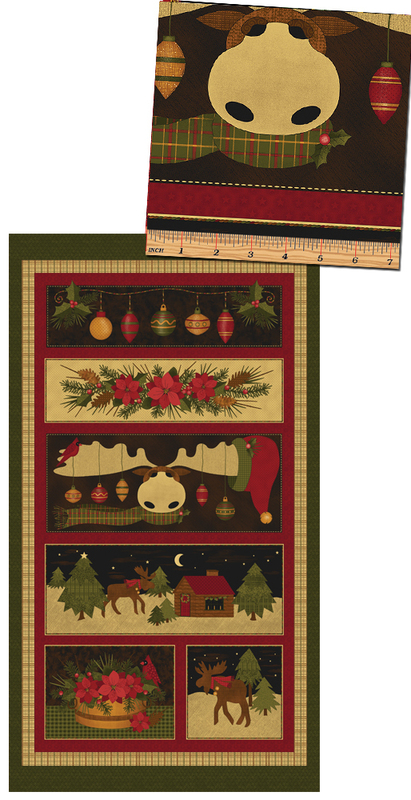 They make great border prints for pillows or small quilts made from panel sections. I tend to like darker colors. I really wanted to use black as the background (in the panel), and I chose reds, greens and golds that would pop with the black. Many of the prints will also coordinate well with the Moose on the Loose fabrics—the fabric tones are very close. How do you choose your tonals? 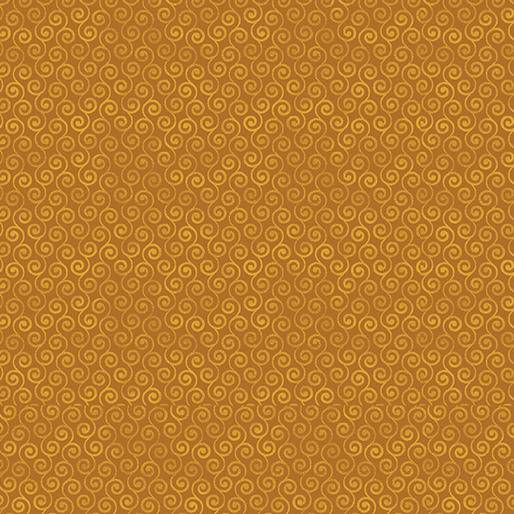 I prefer tone on tones to solids—I like the richness. I’m also a basket maker, and I do my own reed dyeing. I like the way hand dyeing looks; it’s never one solid color, and it looks natural. That extends to fabric as well, so my tonals are checks, swirls, and other small, subtle prints. What do you like best about the collection? I love it on the black background. 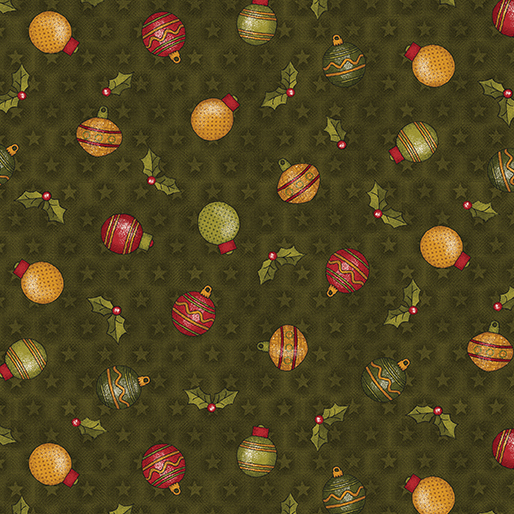 I love the way the red and the gold and the green pop on black. It’s very festive and fun! Who knew a moose could be for Christmas? And…you just might see moose again in the future! Use Cheryl's panel (and coordinates) in a variety of free quilt patterns! Merry Moosemas! designed by Heidi Pridemore, features pieced borders around the panel. 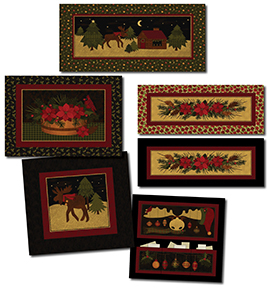 Follow Cheryl's directions to turn the various panel pieces into table runners, pillows, and card holders. 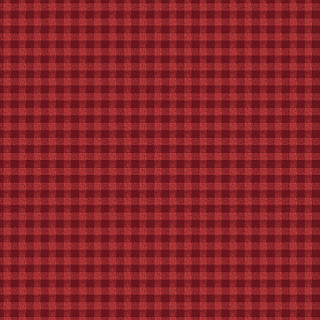 Click here to find the free patterns. 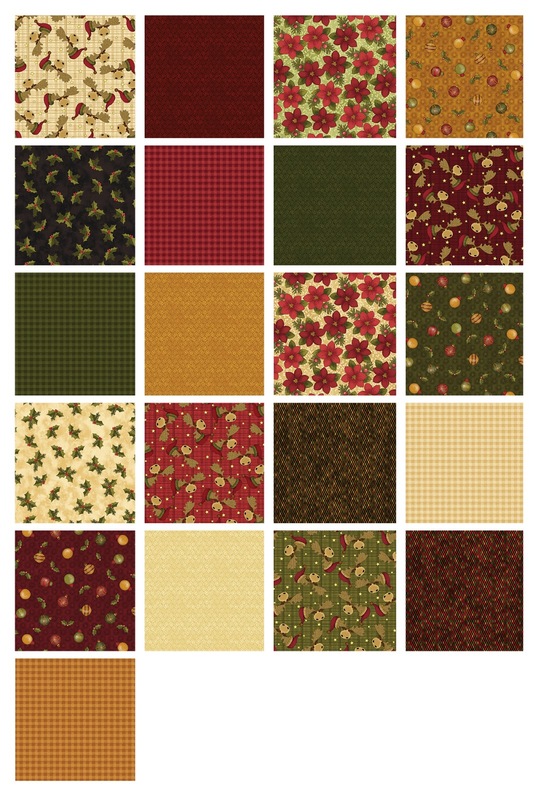 Cheryl has an additional free pattern on her website--a classic patchwork square quilt that allows the fabric to shine. 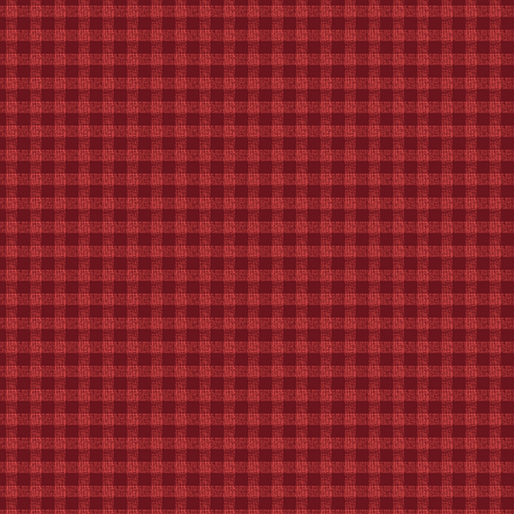 Click here to find it. Click here to see more of Cheryl's work. 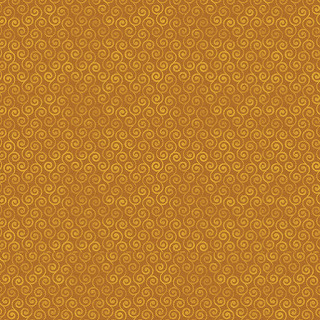 these are wonderful fabrics. I love that the moose holds ornaments. SO NEAT! LOVE THIS COLLECTION!!! cute panel and great project. Hermosas telas, me encantan, ojalá lleguen a Colombia! This is a very nice Holiday line. The Moose is great. 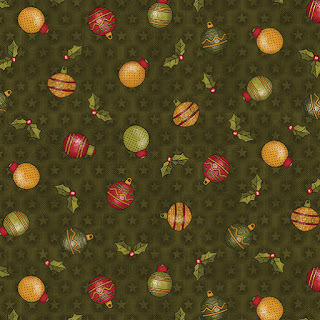 Love.This is the fabrics I see when I think in Christmas fabrics! The Moose is too cute! 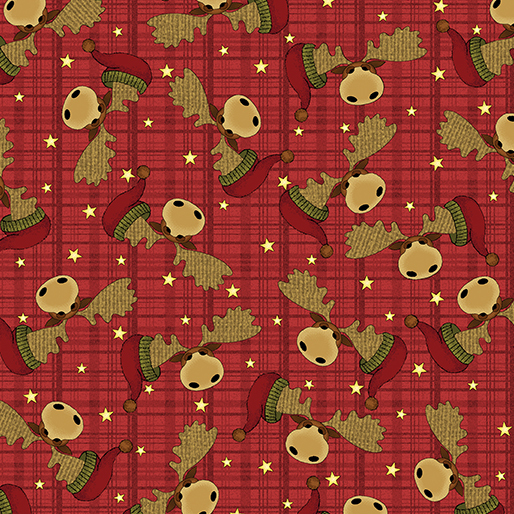 Thank you so much for the Merry Moosemas pattern download. I appreicate that so much.